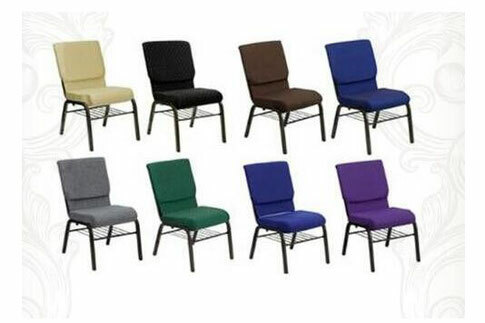 What type of seating are your new church chairs replacing? In other words, are your new church chairs going to replace existing chairs at your church or are they replacing pews that your church has had in place for years? This question is very important as transitioning from pews to church chairs, while very common for churches in our day, can be a very tense process for many churches. Since almost all pews are constructed out of wood, I have found that in such transitions, wood-framed chairs tend to be better received by many in the church. Since the new church chairs have wood frames, the gravity of the transition seems to be muted a bit. Perhaps there is a sense of compromise that exists in such situations and the transition is more amicably accepted. * What is your budget for new church chairs? If the budget for your new church chairs is constrained, then it will immediately become evident to your church that metal-framed church chairs work much better within your budget. In general I communicate to churches that in comparing a quality metal-framed church chair to a quality wood-framed church chair, they will likely be able to purchase 2.5 metal-framed church chairs for every one wood-framed church chair. This does not mean that the metal-framed church chairs are inferior to wood-framed church chairs from a quality standpoint. Rather it just reflects the expense of the raw material to construct the chairs and also the amount of labor that is required to produce a wood-framed church chair. * What are the long-term implications for our church with this decision? The durability of metal-framed church chairs and wood-framed church chairs will be similar assuming quality church chairs are purchased. With wood-framed church chairs you have the possibility of “nicking” the wood frame as you move the chairs around. With metal-framed church chairs you have the possibility of “scuffing” the metal frame as you move the chairs around. But if the chairs are not being moved much, then both of the above issues are basically irrelevant. If your church would ever desire to sell your church chairs, the metal-framed church chairs likely will be far easier to sell and you will also recapture a greater portion of your initial investment. I recently helped a church dispose of over 400 wood-framed church chairs they purchased two decades ago. The chairs were in excellent condition. However, even though they paid about $120.00 a chair two decades ago, they only were able to sell their chairs for $20.00 each. If their chairs would have had metal frames, they likely would have obtained the same $20.00 per chair, but their initial investment would have been far less. versus an objective study. But as I work with multiple architects, interior designers, etc., I find that almost all current contemporary new construction is requesting metal-framed church chairs. As your church decides between wood-framed church chairs and metal-framed church chairs, I believe the above considerations will be of value to your church. And, here is my shameless plug, I recommend you go to Bestar to get the best price on both wood and metal church chairs.